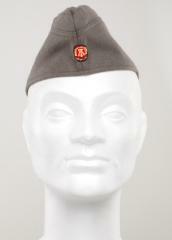 East German enlisted men's side cap. Made of gray wool cloth. Complete with textile cap badge. 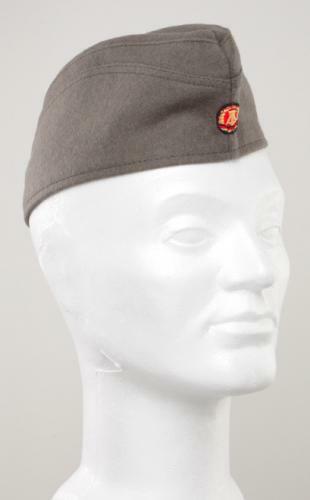 This classic piece of military headwear had its days of glory during WW2 and the Cold War. Wear slightly slanted for a dandy look. Given sizes are head circumference in centimetres. Divide by 3.142 and then by 2.54 to convert to head diameter in inches (US size). If you plan to wear the cap on the top of your head, a size or two smaller might work better. These caps are all genuine surplus from the DDR. In used, but good serviceable condition.